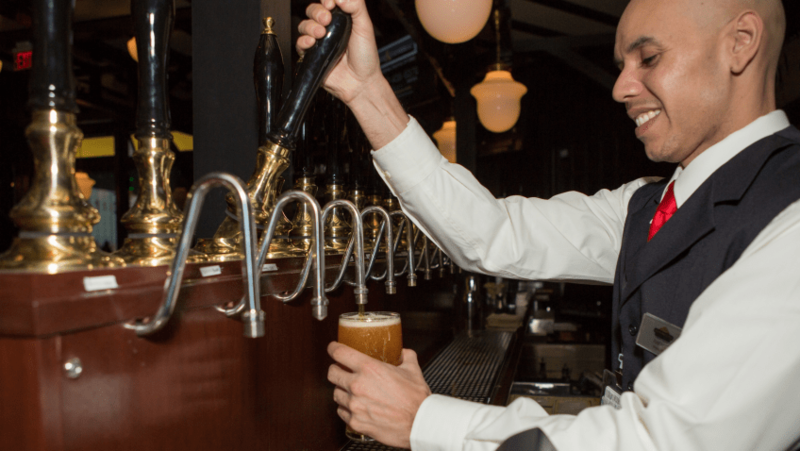 AFTER ONLY 18 YEARS, SHMALTZ DEBUTS OFFICIAL HANUKKAH BEER! 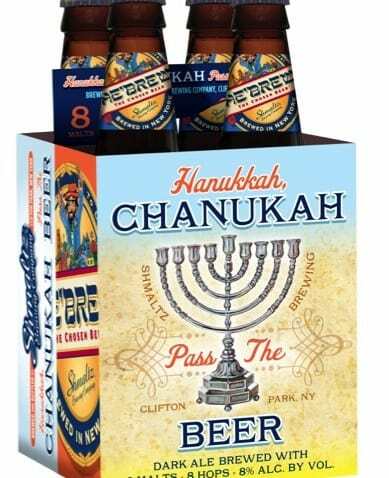 No matter how you spell the festival of lights, Shmaltz Brewing is proud to debut its first-ever limited-edition release specifically celebrating all the miracles of the 8 crazy nights: Hanukkah, Chanukah: Pass The Beer®. 8 is a miraculous number in Jewish life. Its cultural/religious significance runs the gambit with several holidays spanning 8 days (Chanukah, Passover, Sukkot), a bris (circumcision) taking place on the newborn’s 8th day, and Seinfeld running for 8 years (for more deep shtick, see the 4-pack label listed below). The official Chosen Beer of this holiday season, Hanukkah, Chanukah: Pass The Beer® is a Dark Ale brewed with 8 malts, 8 hops, and heats up at 8% ABV. As latkes are frying and the battle royale of dreidels are spinning, Shmaltz offers some much needed light to the impending winter darkness with its latest fermented creation straight from the tanks at their new Upstate New York brewery. Isn’t it fitting, that on our 18th anniversary, Shmaltz Brewing would finally come out with our very first Chanukah beer? says Jeremy Cowan, founder of Shmaltz Brewing Company. 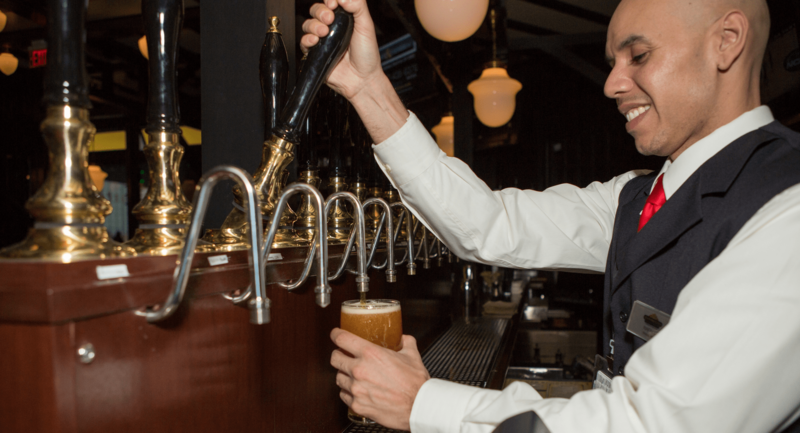 Back in 1996, Chanukah inspired the first batch of He’brew’s Genesis Ale, hand bottled and personally delivered by friends and family to just a few stores from the back of my grandmother’s Volvo. 18 crazy years, 37 states and 5,000 retailers later, we have our very own brewery and the freedom to brew any style of beer when we want, how we want. So this time around we are thrilled to introduce our interpretation of a winter warmer, a true He’brew Celebration Beer and a new holiday tradition to pair with delicious foods and gelt for my favorite drinking season of the year. 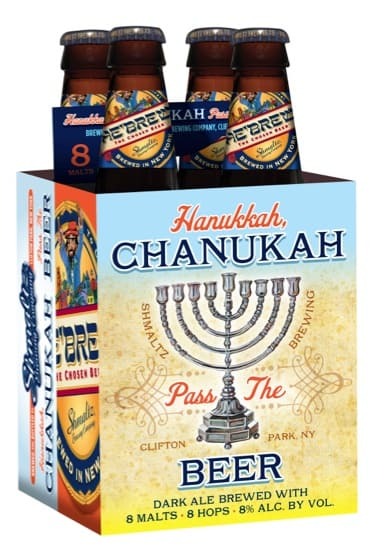 Hanukkah, Chanukah: Pass The Beer® will be nationally available in 12 oz bottles in 4-packs starting on November 1, 2014, as well as in this year’s He’brew Gift Pack® hitting stores before Thanksgiving.